While levels of walking reached a 10-year high in Northern Ireland during 2017, new figures highlight a lack of progress when it comes to encouraging more people to cycle. 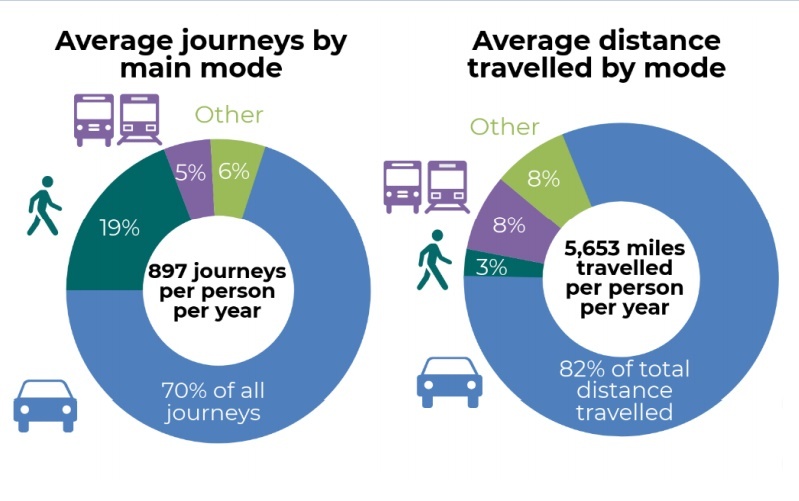 Published on 31 January, the latest national travel survey for Northern Ireland shows that 20% of all journeys made in 2017 were by foot – the highest level in the past decade, but only 2% higher than 2007 (18%) and 1% higher than 2016 (19%). When asked what would encourage them to walk more often, respondents said better weather (37%), the time of year (17%), better lighting on footpaths at night (16%) and more pleasant footpaths (15%). Only 1% of journeys in 2017 were made by bike – the same percentage as in 10 of the last 11 years – while 70% were made by car occupants, 48% as drivers and 22% as passengers. Among the most popular incentives that people said would encourage them to cycle more frequently were: more cycle lanes (37%), better weather (33%), cycle lanes separated from roads (33%), more pleasant and safer cycling routes (both 28%). The survey also shows that over the last 10 years, there has been an increase in the proportion of women holding a car driving licence. In 2015-17, 72% of women held a licence – compared to 62% in 2005-07. Over the same period, there has been no real change in the proportion of men holding a licence (80% in 2005-07, compared to 82% in 2015-17). On average, each person travelled 5,653 miles per year during 2015-17 – a decrease from the average distance travelled in 2005-07 (5,999 miles).